The new 50P-1857 SMA, programmable attenuator, offers solid-state reliability and speed as well as superior broadband performance (200-6000 MHz). It has a dynamic range of 0-95dB in 1dB steps and is guaranteed monotonic across the band. TTL control and SMA female connectors are standard, but other control and connector configurations are also available. The new 50P-1857, programmable attenuator from JFW Industries, offers solid-state reliability and superior broadband performance. With an operating frequency range of 200 to 6000 MHz, it is ideal for today’s wideband variable attenuator requirements including VHF/UHF, LTE and WiMax testing applications. This 50-Ohm device has a dynamic range of 0 to 95 dB in 1 dB steps and is guaranteed monotonic across its entire bandwidth. It is rated to handle up to 20 dBm of RF input power with minimal compression and as high as 25 dBm without damage. The VSWR is a maximum of 2.0:1, or greater than 9.54 dB of return loss. The 50P-1857 also changes attenuation settings quickly with an impressive 300 nanosecond switching speed. The seven-bit attenuator is controlled via seven TTL lines (TTL High turns pads ON, TTL Low turns pads OFF) and it requires a 5 Volt DC supply. SMA female connectors are standard on the input and output, but other connector configurations may also be available upon request. These specifications, along with a compact and rugged package design, have instantly made the 50P-1857 the new flagship of JFW’s attenuator line and spawned several other new model based on its design. 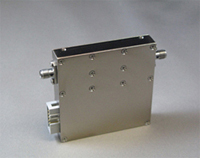 In addition to the 0-95 by 1 dB-model described above, other attenuation ranges are available. They include a 0 to 63 dB in 1 dB step version and a 0 to 31.5 dB attenuator with 0.5 dB resolution. And, for applications where it is not possible to maintain uninterrupted TTL control signals, JFW also offers a digitally latching solution. Building on this assortment of innovative programmable attenuators, JFW Industries continues to expand its line of RF and microwave test equipment by launching a brand new family of programmable attenuator assemblies for automated testing applications. The family begins with the basic 50PA-516; a plug and play RF test solution consisting of two 50P-1857 programmable attenuators (on independent RF paths) integrated with a single Ethernet/RS-232 network interface for remote control, a front-panel interface for manual control (via sixteen-button keypad with three-line display), and a universally adaptable AC power supply (100 to 240 Volts AC @ 47-63 Hz). This complete testing solution allows the user to instantly automate the variable attenuation stage of the test process, dramatically reducing total test time. Computer control offers the user a variety of programming options.